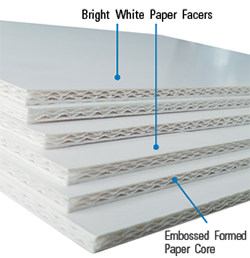 Dispa® is the all new 100% paper board from 3A Composites USA, comprised of a uniquely laminated structure of embossed formed paper giving it strength and rigidity. The embossed structure forms the central layer of Dispa® with flat, smooth surfaces that are ideal for printing. Fast, efficient and easy processing - even with hand tools! 3.8mm (0.15") Bright White 48"x96"
3.8mm (0.15") Bright White 60"x120"